There’s no shortage of Sub shops in Clarendon/Courthouse. Between Earl’s and the chain options of Subway & Cosi, there’s more than enough options if you want lunch meats in between two slices of bread. However, I became interested with the arrival of a new sub shop on Washington Blvd. 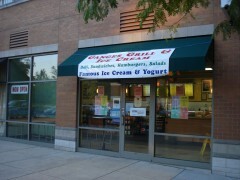 The former Quizno’s location was now draped with banners reading, “Ganges Grill and Ice Cream.” I decided to walk across the street from the Subway (where I am currently mayor on foursquare) to find out more. Talking with the current Ganges owner, I found out that he was friends with the former Quizno’s franchisee and inherited the storefront after the former Quizno’s owner decided to shut down operations. The decision from closing Quizno’s to opening Ganges happened in a matter of a weeks. The sudden and rough transition was apparent when I first walked in. The storefront still had a lot of the old Quizno’s equipment and furniture, now covered up with computer-printed signage that was in bad need of a copy editor. The plethora of signs made the front-end look busy- and not in a good way. The store was actually empty (as it was when it was a Quizno’s) when I visited. The staff also appeared green and inexperienced, when I ordered a roast beef sub the help had to refer to the menus hanging above them in assembling the sub. Clearly the shop was going through some big growing pains. However, there’s hope in food they produce, which was certainly not that bad. The saving grace for Ganges was the “Famous” Ice Cream, which is supply by nearby Thomas Sweets. While the sandwich scene is crowded, the store can make in-roads as a local ice cream stop. But the final verdict on this store is still up in the air. If I was the new owner of a sub shop, I would be making the subs. Try Vace in Bethesda for real subs (great bread, great toppings, and made to order).